Star Wars: The Force Awakens is on the verge of entering its fourth weekend in theaters, and a lot of fans are ready to watch it again. If only to see one of the film's breakout characters a second, third or fourth time. 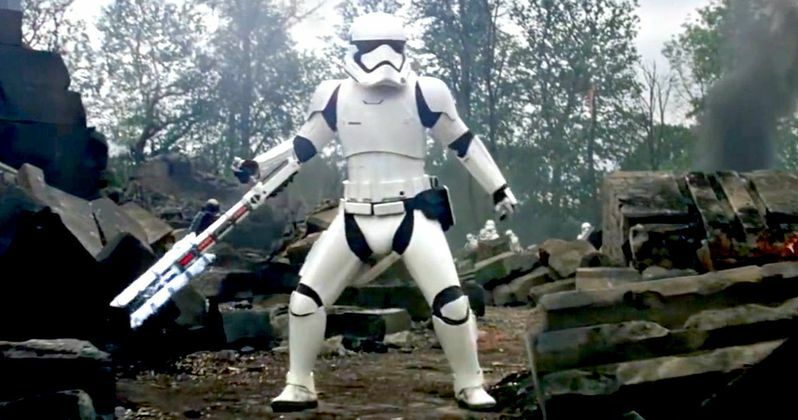 While Gwendoline Christie's Captain Phasma was supposed to be the next Boba Fett, that distinction was actually earned by a Z-6 baton wielding Stormtrooper who calls Finn out as a traitor before engaging in a baton-lightsaber battle on the grounds of Maz Kanata'a Castle. He has since been dubbed TR-8R, and set off a firestorm of memes around the Internet these past couple of weeks. Earlier this week, we learned more about TR-8R's backstory. And now, LucasFilm has confirmed the true identity of the First Order's most loyal soldier. TR-8R's official name is Nines. He earned that nickname from his Stormtrooper code FN-2199. The character was first introduced in a Journey to the Force Awakens tie-in novel by Greg Rucka entitled Before the Awakening. If you want to get to know Nines a little better, you can order the best-selling novel Here. It is a companion piece to Star Wars: The Force Awakens, an anthology book that focuses on the lives of Rey, Finn, and Poe before the events seen in the movie. In the book, we discover that Finn was part of a four-man fire-team. He grew up with this special squad, which featured himself (FN-2187) along with Stormtroopers FN-2199, FN-2000 and FN- 2003. These three other soldiers have earned the nicknames Nines, Zero and Slip. While the first two names are in direct relation to the First Order codes given, Slip has earned his nickname for slipping up once to often. Nines and Finn trained closely together, and that's why he so easily identifies Finn outside of Maz's Castle without his Stormtrooper helmet on. In the photo you see below, which is from the Before the Awakening novel, you can see TR-8R (or Nines, if that's what you want to call him now) without his helmet on. He is the one with the red hair. The man responsible for Nines voice is Skywalker Sound sound editor David Acord, who delivered the now classic line 'Traitor!' He has worked on the prequel trilogy and both animated series. The man inside the armor is Liang Yang, a veteran stunt performer who knows his way around a Z6 riot baton. He previously lent his talents to such blockbuster projects as Game of Thrones, Pirates of the Caribbean: On Strange Tides, X-Men: First Class, Snow White and the Huntsman, Skyfall, World War Z, Edge of Tomorrow, Dracula Untold, Exodus, and Kingsman. LucasFilm had this official bit of intel on Nines. "There's a reason that Nines gets to use an awesome weapon (which is called a Z6 baton). He's riot control, and part of an elite squad that enforces order or squashes uprisings. While their weapons are non-lethal in theory, the Z6 can definitely cause harm or kill an opponent when used with brute force. Look, if a lightsaber can't cut it, you know it ain't good news." Even though Nines has been officially confirmed as his name, TR-8R has become a part of the Star Wars lexicon and he'll surely be known by both monikers as the franchise movies forward. In Star Wars: The Force Awakens, Nines is put down by a blaster shot from Han Solo. But if he can withstand a few blows from a Lightsaber, perhaps he survived? Will TR-8R be back in Star Wars: Episode VIII? Perhaps Nines does has Nine lives, because StarWars.com says this. "Let's hope we haven't seen the last of Nines. Or TR-8R. Who wouldn't want to see round two...and all the memes it could inspire?" What do you think? Should Nines live? Will you be excited to see TR-8R back on the big screen in a more substantial role? Being a ginger and all, shouldn't he be played by Rupert Grint in the next sequel? Or has this whole thing run its course? Sound off in the comment section below.